A few months ago I learned about Square Timber brewing company through my parents via Facebook. V and I aren’t often in the area, so when we were going to be in town for a wedding we made a point to stop by and check the place out. 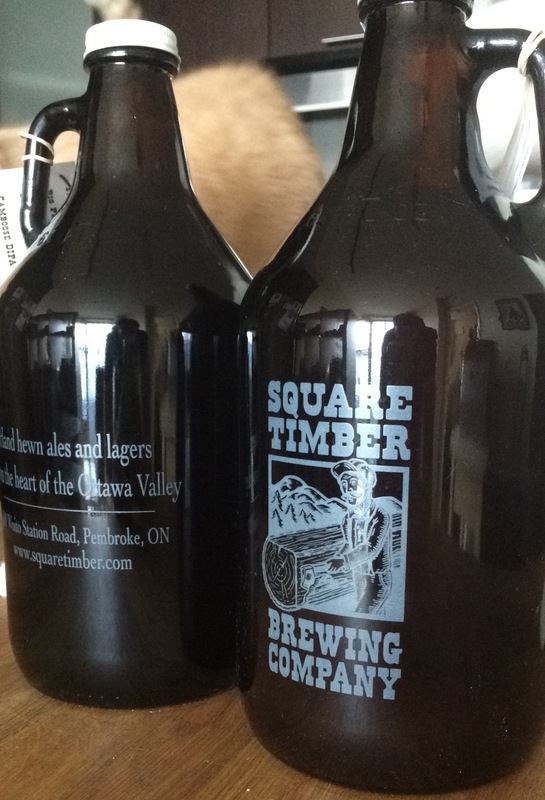 Square Timber is a new entrant to the brewing scene, and the second brewery to open up in the Ottawa Valley. I was also pleasantly surprised to find out that the founder is a member of the Ottawa homebrewing club The Members of Barleyment and decided to go pro. As is the problem with small towns, you cannot get to any of the interesting places without a car. Square Timber is about 20km away from the city center into the middle of nowhere. We fought with some terrible 3G connections in while looking the place up and getting Google navigation working, but in the end it was worth it. Square Timber is on Woito Station road (or as the locals call it, the way to the dump) and requires a decent amount of vigilance to notice the road sign saying “Craft Beer Sold Here”. You’ll drive down a dirt driveway for about 100m to come out to an clearing with a giant log house on the right and the brewery on the left. Stepping out of the car was probably the most wonderful part of the experience. There’s a scent of coniferous wood and trees in the air that’s both pleasing and welcoming. The tap room is a quaint little place with all the beers available listed on the wall and a bar. 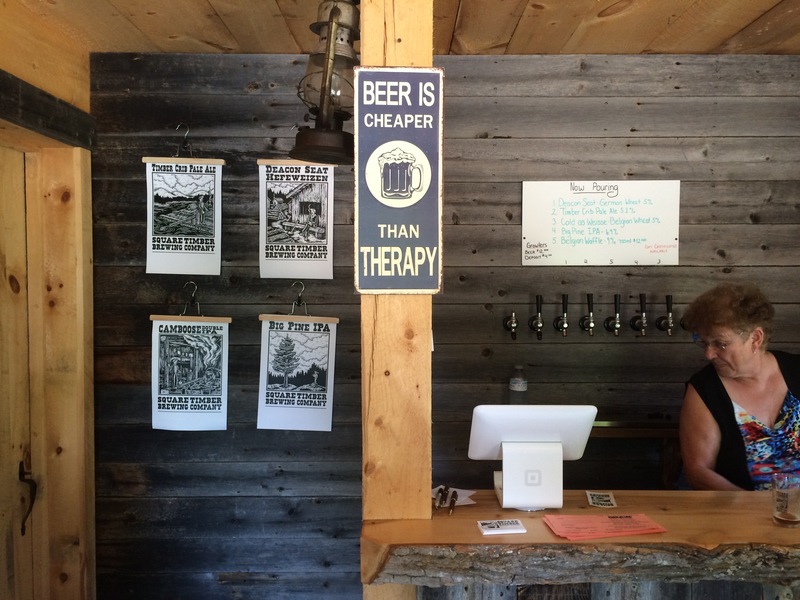 You can try a few samples, buy some growlers and merch but that’s about all you’ll be able to do. Unfortunately the the brewer wasn’t available the day we stopped by, so the place was being manned by some family members in his stead. V and I tried all the samples, starting with some Belgian and German wheat beers. We’ve been brewing a lot of wheat beers recently, and it was nice to taste the similarities in Square Timbers beers. The Pale ale and IPA were both excellent, though I didn’t take any notes so I cannot recall too much about them. The Pale Ale was solid and really enjoyable. We bought a growler, but haven’t drank it yet since we are saving it for a bottling day with friends. The IPA was really aromatic and enjoyable but also a bit boozier so I could maybe have two of those before topping out. The last beer we tried was the Belgian Waffle Quadrupel, which is brewed with maple sap. I could appreciate the beer, but the sap made it far too sweet for my liking. It’s almost as if it had been boiled enough to transform into a light maple syrup! Although it was a 9% beer, there wasn’t any hotness from the alcohol, just a lot of sweet. Unfortunately, this kind of beer isn’t my thing and I couldn’t finish the sample I was given. Square Timber seems to be getting some accounts set up in the Pembroke area, and if you live in that region or in Ottawa consider taking a day trip down to check it out. The trip down to Pembroke via highway 17 is pretty nice, and you could always turn it into a day trip to some sights in the area, like the Bonnechere Caves. If you’re from Southern Ontario, then it’s a bit trickier. It took us a 6 hour drive to get to the area, so this isn’t really something you’d want to do over a weekend. But if you want to perhaps do a camping trip or some cottaging, then maybe you can justify the journey. If for whatever reason you find yourself passing by the area, make sure to see when they are open and make a point to stop by. Marc is making great beer, and we all want to be supporting these new guys.